You might go with just the kilt. However, I think you should soon feel the need for some accessories. A traditional kilt has no pockets. 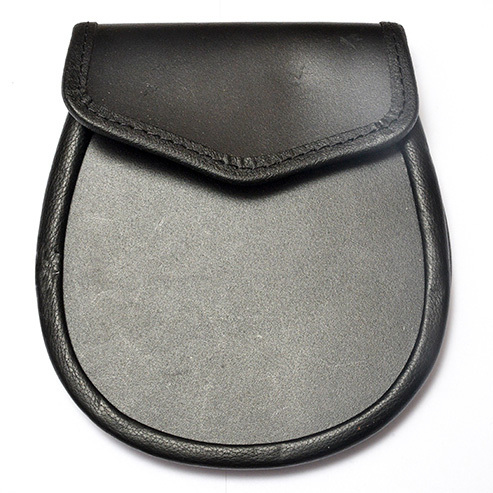 The “authorized” pocket for a traditional kilt is a purse to hang on your front and is called a sporran. There are three types of sporrans, dress sporrans, semi-dress sporrans, and day wear sporrans. For casual wear only the day wear sporran is a possibility. Sometimes it is called a leather day sporran. Most sporrans on the market come with tassels on the front. When you are walking the tassels make you sound like a drummer. To most kilt wearers it seems to be OK. To me it is not. I suggest you go for a plain leather day sporran without these noisy and annoying tassels. Often sporrans with tassels are cheaper than those without them. If you don’t like the noise they produce, cut them off. A chain can be a little bit hard to your kilt, however. That is what many frequent kilt wearers think and accordingly they for casual wear prefer a leather strap. Me too. I have made me some black and brown leather straps for my day sporrans. Want a cheaper, still nice sporran? Must I wear a sporran? Going without a sporran is definitely against rules. Kilt and sporran are often considered strongly connected items. Some kilt wearers will even say that without a sporran a kilt is a skirt. That makes no sense. A car from which something as essential as the wheels have been stolen is still a car, is no bycycle or whatever. "Most people would still think that a Traditional 8 yard kilt looks right only when worn with a sporran, quite apart from the practicality it lends to a garment without pockets in giving you somewhere to carry those coins and keys. But a Casual Kilt is quite another story, and it is entirely a matter of style. If you wish it to resemble the traditional 8 yard garment, a sporran is probably still desirable. But if you are wearing your Casual Kilt as a versatile fashion garment, then how you accessorize is a purely personal style statement. It’s cool either way!" So, according to both vendors you are “allowed” to go without a sporran. But if you ditch the sporran, where then with your “personal” stuff? Pockets in a wind breaker, a photo bag, or you will wear a shoulder bag of some kind. In disfavor of the sporran is also the fact that today’s smart phones are big, very big, and soon they’ll grow out of sporrans, meaning you must have another place to accommodate them. Or sporran makers are to adjust sizes in accordance with today’s needs. If your kilt is designed to sit low, you probably shouldn’t wear a sporran either. I think a sporran is suiting a kilt. And in general I will wear a sporran, even if empty. But going without one adds to comfort. Therefore, on longer walking tours I will from time to time leave the sporran at home. My USA Kilt Casual, which is ordered short to sit low, I at most times will wear without a sporran, and regarding my Sport Kilt, which has convenient slide pockets, I have simply decided to always wear it without a sporran, the sporran strap being in the way of the pockets. An original kilt belt & buckle might be a little bit overdressed for casual wear; nevertheless it looks quite good; and wide-enough ordinary belts are hard to find elsewhere. Also, kilt belts and buckles are most affordable, so go for one. This "standard kilt belt" from Kilt Society is available in black, brown, and tan. The price is only £15. But to use it you must also have a buckle. Buckles with different ornamentation are to buy. Prices vary from about £10 to five times as much or more. On the picture above the buckle has been attached. It is a simple "Celtic knot buckle". I like this cheap one because of its pretty clean design. £12 at Kilt Society. Must I wear a belt? Technically there is no reason why you should wear a belt with a kilt. By means of buckles and straps it stays up perfectly well. However, a kilt looks at its best together with a 2 ¼-2 ½ inch wide belt. If you are wearing a sweater untucked - as it should be – a belt is unnecessary. If you are wearing a waist coat, you should not also wear a kilt belt! They come in many colours. White socks, whether long or short, are not to everybody’s taste; nevertheless most kilt hose are probably white or off white. The reason might be that they'll go with practically every kilt. Other popular colours are black, charcoal, lovat green, lovat blue, bottle green, dark grey, and navy. Kilt hose must not be solid coloured. In fact some Scots like diced ones, I have been told. I myself definitely prefer solid coloured hose. In my book, mixing different patterns is bad taste. But so we are all different. And you do see similar mix in women’s fashion. All kilt vendors I know of are selling kilt hose. Kilt Society has a “Basic Kilt Hose” range, black, charcoal, and white, selling at £8 and some more expensive socks, starting at £20. Otherwise I can recommend Brevin & Co. via Amazon. WB Socks. High value for money. Many of my kilt socks are (forgive me) ladies’ over knees. H&M have for some years been selling some most usable ones. They are available in black or charcoal grey and off white. They are thick and hardly to differentiate from original kilt socks. They are rather affordable, are to get 'around the corner', and extremely durable. 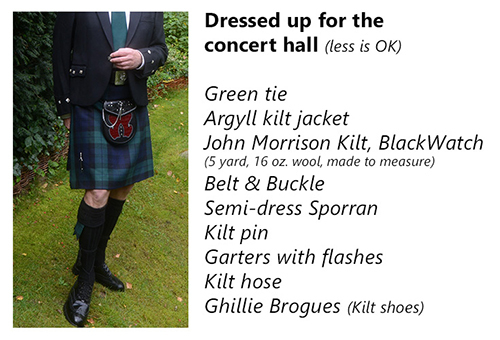 Contrary to most 'authorized' kilt socks they will also stay up by themselves, meaning no garters are needed! To simply keep your kilt hose stay up you might need garters which in fact come as garters and flashes. Except if you are wearing above mentioned H&M Over Knees which are staying up by themselves. Finding, like me, flashes overdressed for casual wear? Just remove the flashes from the garters. The garters themselves are invisible when your socks are folded down just below your knees as they should. And when you need the flashes put them on again. It is very easy. Kilt Society - standard plain colour flashes. £8. 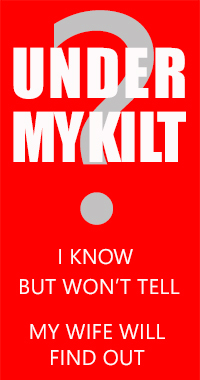 By Kilt Society you can have them at £8. (Standard plain colour flashes). You can also buy flashes in various tartans. They are more expensive and you can use them only together with a kilt in the same tartan. This ends the list of the high land items you need when wearing traditional kilts in a smart casual way. For less than £70 you can have it all. Men's ordinary jackets are too long to wear with a kilt and should look absolutely ridiculous. You’ll have to invest in an Argyle (Argyll) or Braemer, of which the Argyle is the most popular one. It is available in various colours like lovat blue, lovat green, and of course black, the latter probably being the most versatile one. Price level £150-£250. Well, you could go without them, but supposing you already have garters, you’ll also have flashes. While finding them overdressed for casual wear I think they are fine when dressing up. For dress up situations the leather sporran is considered too ordinary. On a semi-dress sporran the front is decorated in some way. Earlier it was always seal skin, but as seal has been forbidden in many countries, including a big market like USA, sporran makers have come up with other solutions. On most dress-up occasions I will simply wear one of my plain day sporrans. A kilt pin is for pure decoration and to be fastened to the outer apron about three inches up from the bottom of your kilt and about two inches from the apron fringes. By NO means it shall hold the two layers of your kilt together! Some will say it helps keep the kilt down in windy weather. It is not my experience. Kilt pins are available in many designs. From about £10. I have several kilt pins which I will only wear at dressed up situations and even then far from always. The sgian dubh is the Gaelic name for the special knife to be worn in your right (or left) kilt hose. Be aware, however, that in some countries the wearing of it could bring you to jail if the blade is a little bit too long. And don't even think of wearing one in an airport. You can have sgian dubhs which are made of harmless plastic, and nobody knows until you draw it. But also replicas of weapons may not be permitted on board an airplane or they might otherwise be considered illegal. I will only wear a sgian dubh at dress up occasions and when at no risk of being accused for illegal possession of weapons. A dirk in the belt, a bonnet, feathers, cap badges, and a playd over the shoulder: Absolutely NO. Too much national dress and should look rather ridiculous if worn by a non-Scott. What you wear – or don’t wear - under your kilt is a matter of personal preference. But the idea of wearing the kilt “as a true Scotsman” on a more or less regular basis might appeal to many kilt wearers. Before you ditch your underpants keep in mind: Wool kilts must be dry cleaned and even if PV-kilts are machine washable they might still need a lot of ironing. You might therefore be in the market for a solution, solving the hygiene problem and still letting you 'feel the breeze'. It is called a kilt liner. Even if making a lot of sense, obviously only two companies are selling them, one of these being G. Lieberman & Sons. Their kilt liner is $24 + shipping (+ VAT, if you are an EU citizen). It is 46 cm long. The other vendor hasn't made changes to his website for 13 years, so whether he is still active, is a big question. This could indicate a small market, compared to before mentioned YouGov findings, according to which four out of ten in a kilt will go without underwear. But out of the seven percent claiming wearing something else under their kilt the kilt liner might have its share. A kilt liner is, in fact, simply a thin skirt or what women might call a half slip. Practically the same thing you can therefore easily find at half or a third the price - provided you can accept it to be sold as a skirt – in the women’s stores. I think of a circular skirt, also called a bell shaped skirt or a skater skirt. Such skirt is, contrary to the “appropriate” kilt liner, wide, really wide, and accordingly much more like a kilt, in fact. The elastic waist and the jersey fabric you’ll know already from your underwear or sport clothes. So nothing feminine per se about that. When worn under a kilt a skater skirt is just open, roomy underwear, which shall protect your precious kilt efficiently against you. But how about comfort, you may ask? Try it out. I guess you'll find this “semi-commando” solution at least as good as the ‘real thing’. Depending on how often you plan wearing your kilt you may need more than one of these protectors. Fortunately they are cheap. The one shown here is from H&M but a lot of stores are selling them. The H&M thing is £9/10 EUR. It comes in neutral black and grey and is 3 yards wide. The length, by the way, is exactly the same as the Lieberman kilt liner, 46 cm or 18 inches. Size Large fits waists up to 38-39". However, if tradition and rules are to be followed, forget about this advice and do what do you must. Also, on windy days or when you have to do a lot of sitting there certainly are better, more straight-forward solutions than going full- or semi-commando. And even then the kilt is a most comfortable garment.